I couldn’t be more excited for the autumn. It has always been my favourite season and no less so now that I live in the US. If anything, enduring five months of 40C weather has made me even more enamoured with the prospect of turning leaves, wooly scarves, and steaming bowls of soups. To me, autumn is the most evocative season. The memories and emotions that it provokes are only more important now that I’m so far away from home. Of course, books play an integral role to my autumnal experiences. In fact, those books that I associate with specific seasons tend to be the ones that I am able to recall with the most clarity. Just as rainy weather demands that I throw myself on the sofa with a copy of Harry Potter and a big cup of tea, autumn’s cool air and falling leaves bring certain novels immediately to mind. This post recommends my five favourite autumn reads – those books that evoke a sense of cosiness and intimacy that feel intrinsically linked to the season. Of course, if you have any your own autumn recommendations to add, feel free to comment down below! Donna Tartt’s novels are a recent discovery of mine, after I had the opportunity to read the first few pages of The Goldfinch and became immediately enthralled. Although the literary merits of that particular novel have been extensively debated, I think Tartt is eminently skilled at writing truly believable characters, albeit placed in relatively unbelievable situations. It is this particular ability that makes her first published novel, The Secret History, such an incredible work. The Secret History is the story of Richard Papen, a student at Hampden College in Vermont. His passion for the study of classics – particularly Ancient Greek – leads him to join the highly selective class of the university’s Classics Professor, Julian Morrow. As Richard gets to know his five fellow students, it becomes clear that there are several mysteries surrounding the group and their activities. It’s no spoiler to say that this novel serves as something of an unconventional murder mystery – a why rather than whodunit. The identities of our murderers are revealed in the books opening pages but what The Secret History offers is an unravelling of the choices and relationships that lead individuals to the commission of such a heinous act. If you’re looking for an autumn read that perfectly captures the hazy coolness of the season, the setting of The Secret History is beautifully appropriate. Despite its plot line – and oftentimes in service of it – the novel evokes a sense of unrivalled cosiness, largely due to its New England setting and the perspective of its Californian narrator. This is one of the few books I’ve read that I desperately did not want to end, and I can imagine no better way to pass some lazy autumn days than with this novel for company. If you’ve worked your way through the archives of The Book Habit, you’ll know that I have a particular soft spot for stories in the mould of anything written by P.G. Wodehouse. One of my favourite books to review over the three years that I ran this blog consistently was Jerome K. Jerome’s incredibly funny novel Three Men in a Boat. Any comedic book written by a British author in the first half of the 20th century is, to me, always worth a read. I was lucky to stumble upon an omnibus of E.F. Benson’s Mapp and Lucia stories whilst still living in the UK. It was at a particularly difficult time – my now-husband (then-fiance) had returned to the US and I was in England waiting for my visa to come through so that I could follow him. I’d left my PhD programme (for various reasons) and was feeling generally aimless and very low. To say that Mapp and Lucia was a blessing is to put it mildly. Rarely has a book happened into my life with such perfect timing. Mapp and Lucia is a collection of stories published by E.F. Benson over the course of the 1920s and ’30s. It follows two snobbish upper-middle-class women as they vie for social control over their respective communities. Although many of the individual stories are told about the women in their separate lives, they are eventually brought together in a truly hilarious and incident-ridden fashion when Lucia (Mrs Emmeline Lucas) moves to Elizabeth Mapp’s seaside hometown of Tilling. The intimacy of the communities depicted and the personal relationships on which the plot and humour rely is, to me, intrinsically linked with the cosiness I’m looking for in the autumn. It’s reassuringly familiar and always comforting. If you’re a fan of P.G. Wodehouse or looking for a cosy and light-hearted autumnal read, this is definitely one for you. I adore just about anything by Oscar Wilde. One of my favourite high school experiences was writing a comparative research paper about The Importance of Being Ernest and An Ideal Husband. From there, I devoured every one of his plays. Perhaps surprisingly, it took me a further decade to get around to reading The Picture of Dorian Gray, Wilde’s only novel. For those of us who come to Wilde’s work through his famous plays, it is perhaps difficult to imagine forgoing the humour and wit for a much darker kind of storytelling. However, I’m sorry that I didn’t come to the novel sooner because it’s a truly remarkable work. The Picture of Dorian Gray follows the story of Dorian Gray, a beautiful young man who has his beauty immortalised by the painter Basil Hallword. Into the plot steps Lord Henry Wotton, a hedonist who expresses to the painter and his muse his view that beauty is the only thing of worth. As a result, Dorian wishes that he can remain young and beautiful forever, with the version of himself captured in the painting ageing in his stead. This wish comes true and we watch as Dorian falls into a life of carelessness and depravity, all the while his painting turning increasingly grotesque and unrecognisable. This novel is one that I associate with those stormy and rainy autumn days. The novel is a gothic masterpiece, sinister in both plot and setting. As with most gothic literature, The Picture of Dorian Gray requires a suspension of disbelief regarding the various supernatural happenings. If, however, you’re looking for a short and beautifully written novel to carry you through a dreary November weekend, this is a perfect recommendation. On a similar vein to my recommendation of The Picture of Dorian Gray, Rebecca is a riveting and eerie piece of work that will help you capture cosiness on those ‘not so perfect’ autumn days. It remains one of my favourite novels (I’ve reviewed it previously on this blog) and is a regular re-read as the days get darker and the weather colder. Published in 1938, Rebecca is narrated by the nameless second wife of Maximilian (Maxim) de Winter. Maxim is the owner of the enormous and beautiful Cornwall estate of Manderley. When the newly married couple return to Manderley after their honeymoon, the narrator become acquainted with the estate’s housekeeper, Mrs Danvers – truly one of the most sinister characters I’ve ever encountered in fiction. Mrs Danvers was unnaturally devoted to the Maxim’s first wife, Rebecca, who died in a boating accident roughly a year before the start of the novel’s plot. Rebecca’s shadow haunts the new Mrs. de Winter as she attempts to adapt to life at Manderley and as Mrs Danvers does her utmost to sabotage the new lady of the house. When the narrator confronts her husband in an attempt to understand Rebecca’s continuing influence over Manderley, he reveals a truth that places the couple on a dangerous and life-altering path. Rebecca is a novel that is replete with unease. Although never truly ‘horrifying’, the reader works through this book with a constant sense of something lurking – a direct reflection of the narrator’s relentless haunting by Rebecca’s presence. Much as with works like Wuthering Heights, however, this is a novel that is also incredibly well written. The setting is powerfully beautiful and impressive, described in mind-capturing detail. For centralising such an extreme character in Mrs. Danvers, the characterisation is also unexpectedly three dimensional and engaging. For those darker days and early nights, I can think of no novel more appropriate than Daphne du Maurier’s masterpiece. If you’re a returning reader of my posts on The Book Habit, you’ll be unsurprised to see The House of the Spirits mentioned here. It is one of my favourite novels (second only to Jane Eyre) and a book that I have previously reviewed on the site. I’ll give a (much abbreviated) version of that review here – although you can click the link to see my detailed thoughts! The House of the Spirits (set in an unnamed country – but well recognised to be Chile) follows three generations of the Trueba family, opening with the story of the del Valles and their young daughters, Rosa and Clara. Clara is set-apart from the outset through her talent for clairvoyance and her prediction of the death of her sister, Rosa (who is also the fiancee of the central male character, Esteban Trueba). It is after the subsequent marriage of Esteban and Clara that the novel truly gains momentum, following the couple as they move to the remote hacienda, Tres Marias. At Tres Marias, in his capacity as the hacienda’s patron, Esteban’s cruelty is brought into sharp focus. The violence that emerges with Esteban commences a cycle of brutality that tails the Trueba family, as the reader follows them through the generations and into political events to which they will be inextricably connected. This multigenerational saga is an impressive piece of fiction for many reasons. It features here, however, for the relationships that it depicts. As I mentioned above, one of the things that I look for in my autumn reads is a level of intimacy between characters. Perhaps it is the sense of isolation that starts to creep in as the days get shorter and colder, that makes us keen to find connection where we can. The House of the Spirits is all about relationships and, to me, evokes a strong feeling of closeness and comfort. Reading such a powerful insight into family dynamics – particularly with the extreme political context as a backdrop – is the perfect antidote to any loneliness that the closing of the year might bring. The element of magical realism might also makes this a very suitable supernatural read for Halloween, if that’s what you’re looking for. Agatha Christie will eternally serve as my go-to author when I need an injection of Englishness. Her books are so heavily associated with autumn for me, largely because I worked on the filming of Poirot during the last few months of the year. I also have fond memories of watching the series on darkening afternoons, feeling that soul-deep comfort that comes with something so familiar and, in many respects, idyllic. Of Agatha Christie’s many books, The Murder of Roger Ackroyd is perhaps my favourite. I’ve reviewed it previously on The Book Habit because, in my opinion, this book is truly a model of crime fiction. If you’re looking for a book to accompany apple pie and cinnamon sticks, anything by Agatha Christie will surely serve the purpose. This book was an unexpected joy when I stumbled upon it, knowing nothing of the author or the title. 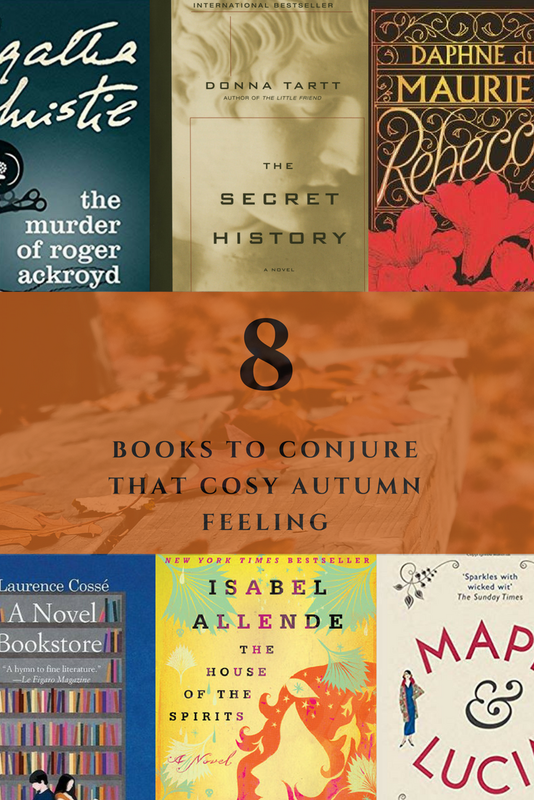 It is a homage to good literature and, since autumn is all about using the extra hours of darkness to indulge in great books, it feels totally appropriate to place it on this list. The novel reads as a love letter to literature, a reminder of its vast and remarkable impact on our lives. Beyond this, the plot is remarkably compelling. It centres on the French bookshop ‘The Good Novel’, created by its founders with a desire to sell only great literature. Initially embraced, the bookshop is eventually derided as a totalitarian concept and members of its committee begin suffering murder attempts. A Novel Bookstore is largely an unravelling of the mysteries behind these attacks, whilst simultaneously telling the story of the bookshop and celebrating the passion for literature that acts as its foundation. For those gearing their reading habits to meet more mystical ends in the build up to Halloween, I highly recommend picking up Howl’s Moving Castle. I didn’t actually get around to reading this book until I had already become well acquainted with the animated film from Studio Ghibli (now one of my favourite films). It’s always difficult to work in the reverse – reading the book after seeing the film – largely because watching characters and settings come to life in front of you basically robs your imagination of the chance to form its own, uninfluenced impression. Howl’s Moving Castle is sufficiently different from the film that it feels like working through two totally separate stories. Even with a version of the wizard Howl firmly imprinted on my mind, it was amazing how quickly an alternative impression formed as I read through the book. The book retains all of the film’s magic and appeal. It is beautifully told, completely weird, and totally immersive. Whether you’ve seen the film or not, this is a leisurely read that will perfectly prepare you to whip up the perfect Halloween costume.